Revised Rate of Dearness Relief to Railway pensioners/family pensioners wef 01.07.2017 : RBE No. 151/2017; GOVERNMENT OF INDIA (BHARAT SARKAR) Ministry of Railways (Rail Mantralaya) (Railway Board) PC-VII No. : 67 RBE No. :151/2017 File No. PC-VII/2016/I/7/2/3 New Delhi, dated. 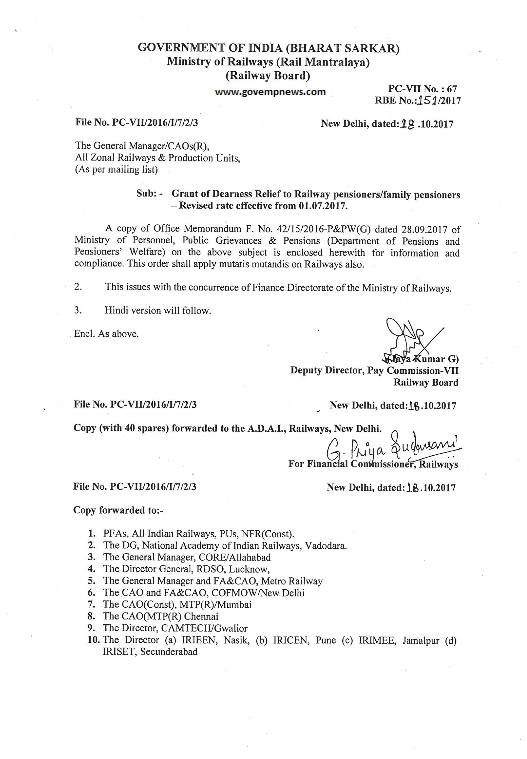 28.10.2017; The General Manager/CAOs(R), All Zonal Railways & Production Units, (As per mailing list) Sub: - Grant of Dearness Relief to Railway pensioners/family pensioners Revised rate effective from 01.07.2017 . A copy of Office Memorandum F.No.42/15/2016-P&PW(G) dated 28.09.2017 of Ministry of Personnel, Public Grievances & Pensions (Department of Pensions and Pensioners’ Welfare) on the above subject is enclosed herewith for information and compliance. This order shall apply mutatis-mutandis on Railways also. Sub: - Grant of Dearness Relief to Railway pensioners/family pensioners Revised rate effective from 01.07.2017 . A copy of Office Memorandum F.No.42/15/2016-P&PW(G) dated 28.09.2017 of Ministry of Personnel, Public Grievances & Pensions (Department of Pensions and Pensioners’ Welfare) on the above subject is enclosed herewith for information and compliance. This order shall apply mutatis-mutandis on Railways also.